An Interview with Sir Thomas Wyatt, the Elder | Wendy J. Dunn, Award-Winning Author. Please click the Book Fair graphic to see all the great authors taking part over the next four days. Welcome to my Blog post for the Historical Book Fair, and thank you Francine Howarth for hosting this great opportunity, which allows readers to find authors and vice versa. I’ve decided to share with you a tongue and cheek interview I did years ago with the fictional narrator of my novel Dear Heart, How Like You This? I hope you enjoy Tom’s interview! Wendy: Firstly, Tom, may I say how truly delighted I am that you, one of the finest metaphysical poets of the Tudor era, has agreed to give his time for this interview. Sir Thomas Wyatt: By my faith, Wendy, time ’tis no longer an issue to me. And, soothly, ’tis doth me good to speak to you. Consider it part payment towards the debt I owe you. Wendy (Confused—her normal state but we’ll not go there! ): Debt, Tom? You owe me no debt! Sir Tom: I am beholden to you, Wendy, and you know that full well! ‘Tis you who listened to me and wrote my tale as best you could. ’Tis something I’ll remember always! Wendy (blushing): Tom, I will never forget you considered me worthy to tell your story. Let’s say we are in each other debts! But I wanted to ask you questions about your life — if it isn’t too painful — your life up to the execution of Anne Boleyn. Would you mind? Sir Tom: You know my tale, Wendy; you could tell it well enough yourself. Wendy: But not as good as coming from your own lips. If you’re ready, we can make a start now…? Sir Tom: Aye—ask your questions. Wendy: So, what can tell us about your early life, Tom? Wendy: Please, Tom! You know you and I disagree about King Richard. I think you best steer us back to safer subjects. Sir Tom: In truth, I fail to understand why you never listen to what I know full well. Do you think my father would lie to me? Wendy: No, Tom, I’m not saying that. And I do listen to you. Even when it meant hours correcting your grammar I listened to you. Tom… why have you got your hand on your dagger? Sir Tom: Making sure its razor is as sharp as your tongue. Wendy: Tom (moving her seat back three spaces), can we please return to the interview? Sir Tom: Perchance that would be for the best. Did you not once tell me that little is known of my early years? Wendy: Yes—and the same goes for Anne Boleyn. Nobody guessed—not even your parents—that history would remember your lives forever. Sir Tom: I like the sound of that. Anne would too, that I know. Wendy: I’m glad. So your schooling happened…? Sir Tom: I was a scholar at John’s College, sent by my father there in 1516. But when I was 17 my father called me home, to be wed to Lady Elizabeth Cobham. It was not a good match. I would have divorced her, but that was impossible after the King had severed ties with the papacy. Also, it would have cast a dark light over the good names of my children. Elizabeth and I separated finally in 1525. Wendy: This marriage produced a son and a daughter, did it not? Sir Tom: Aye. Young Tom and Bess—named for her mother. Wendy: So, as an adult you became a civil servant, like your father? Sir Tom: By the time I was twenty-one I gained a position at court. But I found I had a great liking for travel, and soon began my career as a diplomat. In 1525, I served with Sir Thomas Chene when he was sent as embassy to the King of France. Wendy: Sir Tom, could you please tell us your most exciting moment as a Tudor diplomat? Sir Tom: Aye… I suppose that would have been when the Spaniards captured me in 1527, just before the sacking of Rome. Wendy: I remember you telling me about this. At that time, you were on a mission to the Pope…? Sir Tom: Aye… I went with Sir John Russel as his esquire and equerry, when King Harry sent him to give aid to Pope Clement VII. Sir John had the misfortune to fall from his horse and break his leg at Narni, a small town not far from Florence. His injury meant I had to act in his stead to best serve the King. I was captured on my return to Narni and Sir John. I knew the soldiers planned to ransom me, but I made my escape before any money changed hands. Not long after that, Sir John and I escaped from Rome when the Duc of Borbon’s army began its bloody assault on the Holy city. Never was I more relieved to make my return to English soil. The following year I went to Calais, where I served the King as his Marshal until 1532. Wendy: There was an important event that happened in Calais, at the end of 1532? Sir Tom: You refer to when the King and the Lady Marquess of Pembroke came to Calais for a meeting with François, the King of France? Wendy: Yes—you knew the Lady Marquess of Pembroke well, did you not? Wendy: Could you please tell my readers…? Sir Tom: My cousin, Anne Boleyn. Not long after this she became Queen to King Harry. What good that did her I know not. Wendy: You had an important part to play at her coronation? Sir Tom: My father was ill, so I took his part as Ewer to the King. By the time of her coronation, Anne was big-bellied with a girl-child. No one knew that then. All our hopes were for a prince. I do not believe the King ever forgave Anne for giving him yet another daughter. When he executed her three years later, the grief broke my heart. Not only Anne dead, but also so many of my close friends. Do you know her last thoughts were of me? She gifted to me her own treasured prayer book. No doubt she wondered if I too would follow her to the execution block. God knows my poor father worried himself ill because he so feared for me. If the Duke of Suffolk had had his way I know my blood would have flowed too that May. Wendy: You wrote a poem about this dreadful time? Himself let him unknown contain. For sure, circa Regna tonat. When the low valley is mild and soft. Fortune with Health stands at debate. The fall is grievous from aloft. And sure, circa Regna tonat. Of innocence to plead or prate. Wendy: How long were you in disgrace? Sir Tom: Not long. ’Tis my belief that the King suffered pangs of guilt on my behalf, because, after he put me in my father’s custody for a short time, he appointed me Steward of Conisborough Castle. Wendy: Thank you, Sir Tom, for giving me your time. 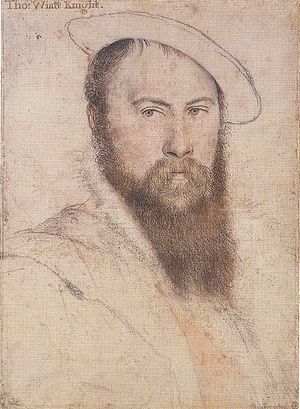 Sir Thomas Wyatt died of a fever in 1542.